Tervahäät is a unique and terrifying monster. With their previous efforts, the duo of Finnish folk experimenters M. Poyhonen and Anima Arctica labelhead Kaarna crafted soundscapes which echoed the vast, frozen tundras of northern Finland. A unique mix of grating banjo, icy ambiance, and warm, deep voices, Tervahäät managed to imbue senses of both vastness and claustrophobia, an agoraphobic sense of inner isolation. 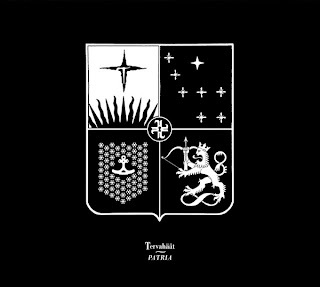 With their sense of adventure, Tervahäät proved themselves to be a more advanced listen, made specifically for the most seasoned and eclectic listener, which, ultimately, and sadly, went largely overlooked. As I mentioned in my review of last year's Kalmonsäie, Tervahäät has been changing since their first, self-titled effort in 2009. Originating in near-pure abstraction, Poyhonen and Kaarna slowly brought in elements of rhythm and clear songwriting over the course of Kalmonsäie, being sure to retain their otherwise unsettling, calculated atmosphere. A bold step which was met with some confusion, but even the biggest Tervahäät fan could not prepare themselves for the change that was to come with Patria, which was released shortly before last year's end. Yes, it would appear that Patria is Tervahäät's most "conservative" work yet, no doubt a product of Poyhonen's mind, which has given us the beautiful Pyha Kuolema. While still airy and Winter-like, we see the music slowly and surely approaching the project's characteristically warm and full voices, concentrating more on songwriting than their usual texture-bent approach. A quiet and calm effort in comparison to its more chilling predecessors, Patria shows a maturity and flexibility which most musicians lack, normally sticking to one characteristic style until it's run its course, only to beat the dead horse further. Granted, those who know me also know I tend to criticize artists who "genre jump" a little too much, and yet I cannot deny that this sounds like Tervahäät! Sure, the overall approach is a little more direct than what I would expect, but Patria still holds some of the unsettling, chilling undertones found in Tervahäät and Kalmonsäie, just sort of...pushed off into the distance. A familiar chill I can only associate with Poyhonen and Kaarna's works still manages to creep up my spine, even at Patria's most beautiful and calm moments. So, sure, this is a departure, but the intent and identity remains intact, making Patria a success. Patria is by far Tervahäät's most accessible release by far, which might not be saying much, but it is definitely the best entry point for those who desire neofolk's more abstract realm. Full of warmth, distant rumbling, and a lurking sense of uncertainty, I can't help but return to Patria even on the warmest of Summer days (though autumn is coming). Expect a new Tervahäät release, titled Taival, on Anima Arctica later this Fall. Apparently a new Key album is on the horizon, as well. Keep your fingers crossed.